The NTFS partition is in an unsafe state. Please resume and shutdownWindows fully (no hibernation or fast restarting), or mount the volumeread-only with the 'ro' mount option. The NTFS partition is in an unsafe state. Please resume and shutdown Windows fully (no hibernation or fast restarting), or mount the volumeread-only with the ‘ro’ mount option. Если у вас возникает ошибка при подклбчении диска windows в ubuntu — The NTFS partition is in an unsafe state. 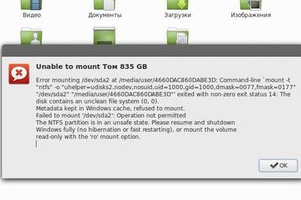 Please resume and shutdownWindows fully (no hibernation or fast restarting), or mount the volumeread-only with the ‘ro’ mount option — значит что система windows была оставлена в режиме сна. Чтобы пофиксить эту ошибку надо установить пакет ntfsprogs. Значит у нас четыре раздела с NTFS. sudo mount -t ntfs -o remove_hiberfile /dev/sdg1 ntfs. Все, польземся. С вами был Александр. Если есть вопросы, пишем в комментариях. Оптимизируем WordPress с помощью плагина WP-OptimizeОфисные пакет для Ubuntu, Linux mint и др.